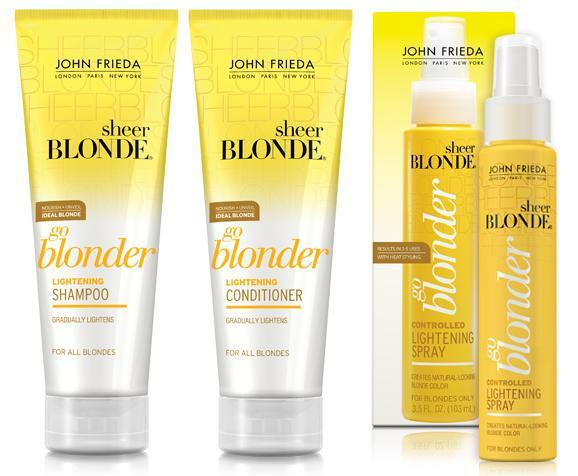 So I invested in the shampoo, conditioner and lightening spray from the the John Frieda Sheer Blonde Go Blonder range in the hope that they would lighten my colour. 'Sheer Blonde® Go Blonder Lightening Shampoo and Conditioner gradually lighten blonde hair for a year-round sun-kissed look while restoring moisture and healthy softness. The formula, containing a natural Lightening Complex,gently reduces the colour pigments in the hair. 'Versatile, patent-pending formula with citrus and chamomile works with styling heat to gradually lighten and brighten for a natural-looking, blonder blonde. Contains thermo-protectant. Patent-pending technology combines fixative and conditioning polymers that retain hydrogen peroxide, allowing for control of lightening. The shampoo and conditioner had a nice consistency that felt nice when I was using them in the shower. They also come in big bottles that last a long time. I didn't notice any lightening of my hair, in fact the patches where I used the lightening spray the most seemed to go more orange than before. The lightening spray left my hair feeling quite dried out and a bit greasy. I didn't really like the smell of the products. The three products totalled at just under £19 which is quite a lot of money for everyday products that don't live up to their claims. So from this experience of the products I would probably only give them a 2 out of 10, however I thought that they would probably work better on naturally light blonde hair that didn't need as much lightening, so I gave them to my friend Anna to try who has gorgeous natural light blonde hair, as she had been saying that she wanted to go a bit blonder but didn't really want to dye her hair. Highly noticeable lightening of hair colour, particularly when she went on holiday and had the sun to intensify the effect of the lightening spray. Didn't have to dye hair which meant no need to use damaging peroxide, bleach or ammonia . The effect was very quick, living up to it's 'works in 3-5 uses' claim. Dried out her hair a bit and made it less soft and silky. She thought the products 'smelt gross'. Anna gave the product a much better 8 out of 10, which leads me to think this is definitely a product that works a lot better on naturally blonde hair that just needs a bit of a boost, rather than coloured hair that is a lot harder to make blonder. For all you bottle blondes out there, the best hair products you will ever buy are purple toning products, as they will keep your hair a lovely light ash colour and free of brassy tones! There will be much more on purple toning products in future posts, but just a quick note- the only way to transform dark gingery blonde to a really light ash blonde is to re dye it, as no toning or lightening products will be strong enough to lift the colour to an entirely new shade...I wish I had known this back in the summer! Have you tried this range and what did you think? Or are you a fan of John Frieda products? Are there any bottle blondes out there who have gone through the same gingery nightmare as me? I used to buy different John Frieda products but I stopped because the products are full of silicons. Hey, I awarded you with the "Sunshine"-award 2011: CLICK! very beautiful dear this post,like it! Antonia- Thanks so much, I will check that out! I like the balanced way you do your reviews. It is important that shampoo and conditioner smell nice. Can you recommend a conditioner that really does make ones hair silky smooth. Have you managed to achieve what you hope for with conditioner or does the quest continue? Only recently have I grown my hair long and had to try to find a conditioner that works. David- I'm very happy you think I write balanced reviews, I try really hard to as I want to give an honest and fair view of the products I write about. Well I use a special John Frieda purple toning conditioner at the moment as it keeps my hair a lovely ash blonde colour and feeling great, however to achieve silky smooth hair I would recommend John Frieda's Frizz Ease Smooth Start Conditioner or Lee Stafford's poker straight conditioner...hope this helps and thanks for such a great comment! Thank you Meg. I have been to boots and bought John Frieda frizz ease smooth start shampoo and conditioner as well as daily miracle treatment spray also by John Frieda. I will start the new regime tomorrow. I hope to be frizz free very soon. I will report back on whether it works for me! I will try to follow your lead with a balanced report. Once again thank you. I think I will try the stronger version of the serum from the outset. The evaluation of Frizz is a very unscientific one for me but I feel the hair looks better. Someone asked if I had had a haircut! Others ask me when I am going to have my haircut which is a bit of a cheek I feel. Hair is to be enjoyed while I can still grow it with colour in it. I just need help learning how to manage it. hiya! i'd just like to warn you that when patch tested on single strands on hair in my salon, the hair actually fell out (on naturally blonde hair and highlighted hair). the spray (not the shampoo or conditioner though!) is so so SO bad for your hair and repetitive use will discolour it or make it simply fall out. i know this post was written a while a go, but i stumbled across your blog from a friend and was having a cheeky peek around and found this post and had to let you know! lots of love, a fellow aspiring blonde! Great post! I actually just purchased the lightening spray, I have natural blonde hair (not as blonde as i would like though :( ) so I wanted to try it out! I will be doing a review about it later on, I hope it works!